Frederick (Freddie) Walter Madeley Lee was born 4 August 1904 in Hythe, Kent. His father was a Sergeant of Musketry in the Marines at the time of his birth and the family moved around a great deal during Freddie's childhood, to the extent that he attended 13 schools, eventually achieving some distinction in the sciences at Warwick School. 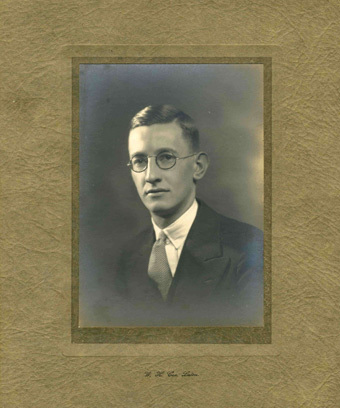 Following an apprenticeship at Daimler, Freddie worked for Amstrong Siddley Motors Ltd and moved to General Motors, Luton, in 1929. It was during his time at General Motors that he invented the Cat's Eye and applied for a patent in January 1932, at the age of 27. The application for 'Road signs &c' was numbered 1728. Unfortunately Freddie's father died in 1925 leaving a wife and three sons. Freddie was the eldest child: his youngest brother only 7 years old at the time of their father's death. Freddie took on the responsibility of providing for the family, including his youngest brother's private education. The cost of pursuing the patent for Cat's Eyes was substantial, we seem to remember Freddie saying it was around £1,000. Due to his other financial commitments, Freddie was not able to fund the patent application and had to abandon it. Between 1939-1945 Freddie worked for the Ministry of Air, setting up production lines for the manufacture of aircraft. Freddie went on to invent other products and set up a company to make high-quality, precision gauges, which he sold in 1968. He also worked on developments in high-speed travel and wave energy, as well as researching the effects of the moon on our weather. During the course of Freddie's lifetime there were many references to Percy Shaw inventing Cat's Eyes. In the mid 1960's Jack Di Manio was interviewing Percy Shaw for the Today programme on BBC radio from Bristol, when it was claimed that Percy Shaw invented Cat's Eyes. The programme was broadcast between 7am - 8am, then repeated. Freddie contacted the BBC during the first broadcast to point out the error, and Jack Di Manio apologised on the later show. Freddie died at his home in St Mawes, Cornwall, on 2 February 1977 at the age of 72. This website has been created by Freddie Lee's daughters, Heather Lee and Jackie Lee. For more information, contact [email protected].